sciencemug sip science & laugh: WAS REALLY CURIOSITY THAT KILLED THE CAT? 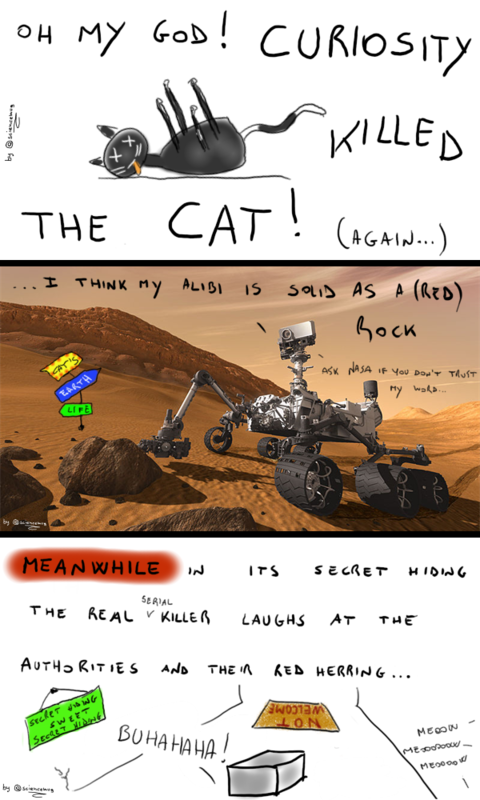 WAS REALLY CURIOSITY THAT KILLED THE CAT? Curious about Curiosity (hahahah, I've made a joke...)? Go here! "CAT'S" is a joint by the way, only the foam of red space-cats hang out at that place... Yes, as you probably already suspected, cats are indeed aliens who a long time ago decided to do humanity 'a favour': to hypnotize it and exploit it. And they did. Quickly. And relentlessly. Then, our new furry lords from outer space thought they had fulfilled their plan and decided to show us their benevolence and to thank their gods with two ancient sacred rituals of theirs: the 'vomit slimy balls of hairs over precious carpets and inside expensive shoes' ritual and the 'sharpen the nails on couches and/or courtains and/or human skin' ritual. In short, humanity's will was annihilated. We were cats' puppets. But in 1935 a man came, his name was Erwin Schroedinger. He was born normal, dominated by cats as the rest of us, only, after an incident with a radioactive book of quantum mechanics, his brain was re-wired so he could overcome the feline hypnosis. Erwin then became conscious of our situation, he rebelled and created a wapon. A weapon that finally allowed humanity to fight back. The rest is history and PiPs passed me the flu so I'm under medications and uuuh, look at that... A huge flock of banana peels is migrating west!